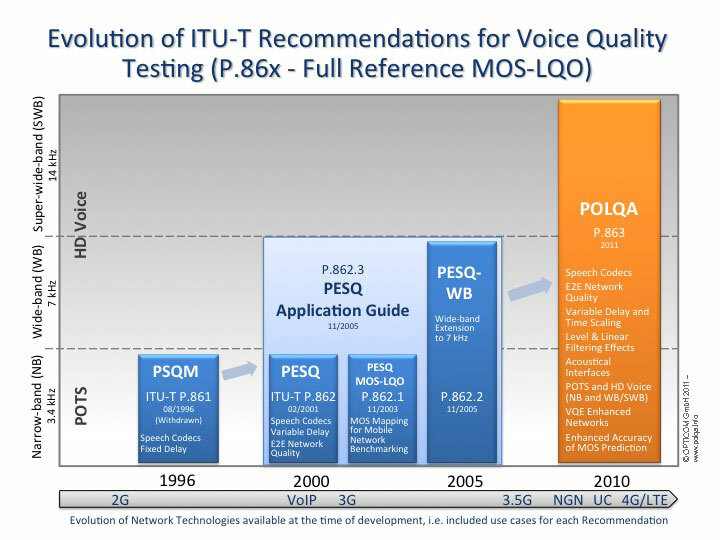 POLQA®, or “Perceptual Objective Listening Quality Analysis” - is the next-generation voice quality testing standard for fixed, mobile and IP-based networks that was adopted in 2011 as ITU-T Recommendation P.863 and successor to P.862/PESQ. Since 2001, PESQ (ITU-T Rec. P.862) was the standardized benchmarking of voice quality in drive test tools and network testers; however during 2006-2011 the foreseen changes within networks placed a requirement onto ITU-T Study group 12 to develop an upgrade. POLQA is the long awaited technology upgrade covering latest speech coding and network transport technology, with higher accuracy for 3G, 4G/LTE and VoIP networks and extending support for networks delivering HD-quality voice services, previously unavailable within telecommunications. The POLQA perceptual measurement algorithm is the joint development of OPTICOM, SwissQual and TNO, protected by copyrights and patents and available under license as software for various platforms. Leading Test & Measurement manufacturers have adopted POLQA/P.863 in their products, or use this technology during development, design and optimization of mobile phones, Smartphones, network components, or services. It is anticipated that POLQA/P.863 will supersede PESQ/P.862 in the future. What is the POLQA coalition? The POLQA coalition formed by OPTICOM, SwissQual and TNO is the outcome of the competitive standardization process run by the ITU-T (International Telecommunication Union - Telecoms). An expert group within Study Group 12 of the ITU-T, including experienced developers who had already contributed to the standardization of P.861 (PSQM), P.862 (PESQ), P.563 (3SQM) and several more perceptual measurement standards, spent more than four years on developing and evaluating various candidate algorithms to find a suitable successor to PESQ. The candidate models submitted for testing by OPTICOM, SwissQual and TNO were the only algorithms that clearly met the criteria in the ITU-T selection phase in June 2010, and in response to the industry's request for uniform testing metrics, OPTICOM, SwissQual and TNO have agreed to combine their expertise into a joint solution – POLQA. Who will offer POLQA/P.863 products? Leading Test & Measurement manufacturers have (or shortly will have) adopted POLQA/P.863 in their products covering a wide scope of applications from lab tools, production testing, network design and optimization to benchmarking and monitoring. In order to find out which is the proper tool set for your application, you may look up our reference list of licensed companies, organizations and POLQA product vendors. What POLQA/P.863 offerings are available from OPTICOM?  All POLQA licensing requests will be handled by OPTICOM as the sole licensing agent on a one-stop basis. OPTICOM will provide POLQA OEM toolsets for various platforms (see following question). SwissQual, TNO and KPN will not actively engage in licensing.  For end-users OPTICOM will provide POLQA within the well-known PEXQ software test suite for Windows.  In case you are looking for consulting services based on applying POLQA benchmarks, you may also enquire at OPTICOM. Which platforms/operating systems will it be available for? OPTICOM will provide POLQA OEM toolsets for various platforms, including Windows, Linux as well as operating systems for mobile devices, e.g. Android. In case your target platform/operating system is not mentioned here, please feel free to enquire. What does it have to do with 'HD Voice'? POLQA will offer immediate, strong support for testing of new wideband 4G/LTE networks delivering HD-quality voice services. Tests carried out during the POLQA evaluation included future technologies such as Unified Communications, Next-Gen Networks and 4G/LTE, which might support HD Voice, i.e. "wideband" and "super-wideband" telephone calls of 7 kHz and 14 kHz frequency range. The arrival of HD Voice capabilities is expected to signal the demise of classical band-limited telephony perception metrics. What issues does it fix with PESQ in CDMA? Certain limitations of PESQ, the existing ITU-T Recommendation P.862, became obvious in benchmarks of the CDMA and Chinese 3G TD-SCDMA networks, when employing specific speech codecs that affect the temporal structure of the transmitted signal. Such effects have been reported in Amendment P.862.3. While PESQ will in principle be able to score any such recent speech codec, the absolute quality scores achieved might not be directly comparable to other speech codecs. In other words, differences in accuracy of the PESQ approach must be kept in mind when doing a 3G versus GSM benchmark. These issues have now been addressed and overcome by POLQA. What does this mean for PESQ? 3G, 4G/LTE mobile operators who want to accurately benchmark and optimize the Quality-of-Experience (QoE) as perceived by subscribers should consider migrating to POLQA quite quickly. NGN network operators who want to test and optimize HD Voice services should immediately consider POLQA. Consequently, service providers and vendors of Test & Measurement and DTT products are encouraged to migrate to POLQA according to their customer’s demands. PESQ-based measurements will still be considered an industry standard for several years, also for reasons of backward compatibility. However, unless mandatory because of one of the above reasons, for many use cases an immediate upgrade to POLQA might still be dispensable. What makes POLQA better than other approaches? Is POLQA the same as XXXXX from Supplier X? POLQA is the only approach that has been selected after rigorous testing in a four year competition between the recognized leaders in speech quality testing. POLQA is also the only approach that has official ITU-T approval. Although some vendors might claim an equivalent 'standard', those approaches are not recognized as standard by the international community. To allow users of POLQA to be re-assured they are purchasing approved solutions from recognized vendors, only officially licensed POLQA vendors are entitled to use the POLQA ‘Hallmark’ logo on their products. What does the POLQA Hallmark guarantee? Only officially licensed POLQA vendors who offer products of proven conformance to ITU-T P.863 are entitled to use the POLQA ‘Hallmark’ logo on their products. Approaches or vendors that do not feature the POLQA ‘Hallmark’ logo have not reached the rigorous standard of reliability and testing required to receive this distinction. How much testing has there been to check POLQA is the best solution available? An enormous amount of effort has gone into ensuring POLQA works quickly and accurately. For example, more than 100,000 samples of mobile and VoIP phone calls were used to train and optimize the POLQA algorithm. POLQA is superior to existing standards, and has overcome all known issues and limitations of PESQ. Is POLQA an Open Source Standard? No, POLQA is not open source and also there is no public source code available for download from the ITU-T website. Please keep in mind that Recommendation P.863 is defined by an algorithmic description and pseudo code for some essential parts of it. There is no directly compilable source code for POLQA available. However, POLQA is available in various form factors to cover all needs from academic/educational use, standards development, commercial end-use and OEM licensing for product adoption, see here. POLQA is licensed under 'FRAND' terms (see here). "POLQA - Perceptual Objective Listening Quality Analysis"